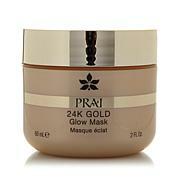 PRAI 24K Gold Wrinkle Eye Serum .5 oz. Serum for over-40 skin that combines a biopeptide with state-of-the-art key ingredients and botanicals, plus a creme combining precious metals, peptides, PRAI's proprietary extract and other key ingredients to help minimize the appearance of fine lines and wrinkles and give skin a gorgeous golden-looking glow. Linefactor is a registered trademark of BASF Beauty Care Solutions France SAS. Ingredients: Propylene Glycol, Aqua/Water/Eau, Cyclopentasiloxane, Alcohol Denat., Cyclohexasiloxane, Butylene Glycol, Glycerin, PEG/PPG-18/18 Dimethicone, Octyldodecyl Stearate, Hibiscus Abelmoschus Seed Extract, Sodium Hyaluronate, Glucosamine HCl, Pisum Sativum (Pea) Extract, Bambusa Vulgaris Leaf/Stem Extract, Saccharomyces/Xylinum/Black Tea Ferment, Dimethiconol, Palmitoyl Oligopeptide, Tetrahexyldecyl Ascorbate, Calcium Aluminum Borosilicate, Isodecyl Isononanoate, C4-24 Alkyl Dimethicone/Divinyldimethicone Crosspolymer, Polydiethyleneglycol Adipate/IPDI Copolymer, Zingiber Cassumunar Root Oil, Glyceryl Polymethacrylate, Silica, Gold, Hydroxyethylcellulose, Sodium Chloride, Xanthan Gum, Phenoxyethanol, Fragrance (Parfum), Benzyl Salicylate, Amyl Cinnamal, Citronellol, Hexyl Cinnamal, Butylphenyl Methylpropional, Limonene, Alpha-Isomethyl Ionone, Titanium Dioxide (CI 77891), Tin Oxide (CI 77861), Yellow 5 (CI 19140), (CI 77480) Gold. Ingredients: Aqua/Water/Eau, Glycerin, Cyclopentasiloxane, Cetyl Alcohol, Helianthus Annuus (Sunflower) Seed Oil, Isononyl Isononanoate, Butylene Glycol, Cetearyl Alcohol, Palmitoyl Tripeptide-5, Silk Powder, Sodium Hyaluronate, Colloidal Gold, Sodium PCA, Hydrogenated Lecithin, Silica, Mica, Gold, Tin Oxide, Zingiber Cassumunar Root Oil, Dimethicone Crosspolymer, Glyceryl Stearate, PEG-100 Stearate, Ammonium Acryloyldimethyltaurate/Beheneth-25 Methacylate Crosspolymer, Cetearyl Glycoside, Caprylyl Glycol, Xanthan Gum, Calcium Aluminum Borosilicate, Disodium EDTA, o-Cymen-5-OL, Phenoxyethanol, Fragrance (Parfum), Amyl Cinnamal, Benzyl Salicylate, Citronellol, Hexyl Cinnamal, Butylphenyl Methylpropional, Limonene, Alpha-Isomethyl Ionone, Titanium Dioxide (CI 77891), Yellow 5 (CI 19140), Red 4 (CI 14700). 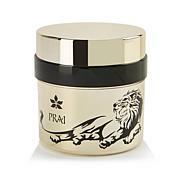 I had used Prai wrinkle cream in the past and stopped because of financial issues. I noticed after a month or two the difference in my skin tone and overall facial and neck health. It was more blotchy and red. I have started back and have been using it for around a month and can totally see a big difference. Its a bit of a burden to pay for it, thats the only issue I have with it. I know you have to pay for beauty. This was a gift from my mom. I'm 35 and been using this product for 6 months. I get so many compliments from coworkers and strangers telling me I look like I'm 23. It makes my skin soft and refreshed. It is a must have and will continue to use it. New to line - 2nd purchase. Love the silky feel. I use this everyday to make my skin look good, I can even go without wearing base makeup, I use a little eye makeup and go. I'm 67 and don't go a day without my PRAI serum and creams. 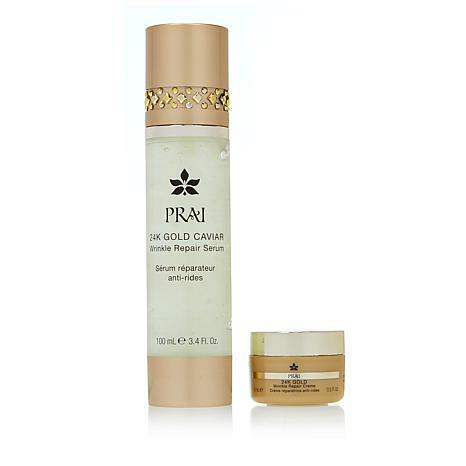 PRAI is a world-renowned skincare company dedicated to creating age-defying beauty products infused with their exclusive, signature ingredient: Prai Root essence. Passionate about offering skincare with high-performance ingredients and innovative technology to all women, their vast array of products boasts results-oriented formulas with luxurious, silky textures.